Pendant; Swarovski Crystal Briolettes are always popular. 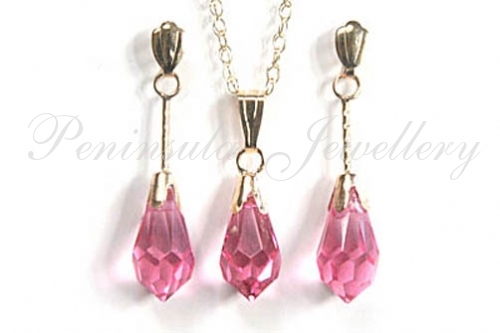 This Pink crystal pendant is 6mm wide x 18mm drop and has 9ct gold fittings. Complete with 9ct gold 18" Prince of Wales chain. Earrings; Matching the pendant, these Pink crystal earrings have standard posts and backs in 9ct gold. Dimensions: 6mm wide, 24mm drop. Made in England. Presented in a luxury gift box – Great Gift! !